In the last few days I’ve been assisting a reader of this blog who also has an ImmerSUN immersion heater controller plus PowerVault storage battery combination. Like me, he had the immerSUN first and later added a PowerVault, but had immediately disabled the ImmerSUN to get the PowerVault to work. Left to their own devices, the ImmerSUN will normally take the surplus power first before the PowerVault has chance to respond since it has a more dynamic control system, however economically it makes more sense to prioritise the PowerVault. I previously posted on this topic in Prioritising smart loads for self-consumption but wanted to provide more clarity on the orientation of the clamps. Both ImmerSUN and PowerVault rely on current clamps to get their control signal. Such clamps fit around an electrical cable and measure the flow of electricity through that cable. Normally clamps for both these devices alone would be around the live in the incoming mains cable, but do that with both and the ImmerSUN will always take the available power first which is undesireable. 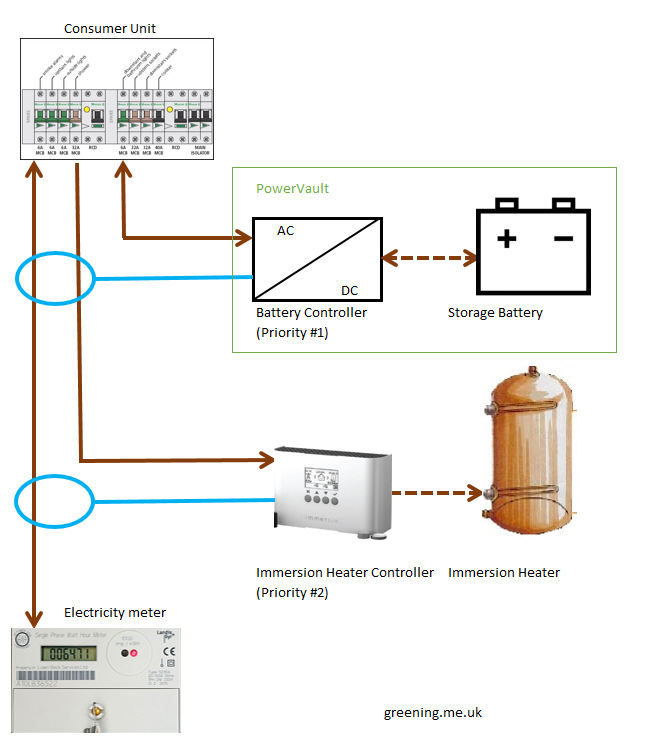 The illustration shows my solution, as per the prior post, where the PowerVault clamp surrounds both the incoming live and the live output to the immersion heater. If the clamps are correctly orientated, this allows the PowerVault storage battery to be prioritised over the ImmerSUN immersion heater controller. When the PowerVault clamp surrounds the two cables, it is important that outgoing power to the grid and outgoing power to the immersion heater from the consumer unit pass through the clamp in the same direction. This solution should work for clamp-driven solutions too. The PowerVault clamp is directional – it has an arrow which should point towards the consumer unit. That means, if you pair the two cables as I described, so outgoing power flows in the same direction in both cables through the clamp, then the arrow should point in the opposite direction i.e. towards the consumer unit. Fundamentally it doesn’t matter which way the ImmerSUN clamp faces, as during commissioning the ImmerSUN will work it out by cycling the power several times, but you shouldn’t change it after commissioning. This entry was posted in Electricity storage, Energy Smart, Water heating on 14/04/2018 by Greening Me.